John McCain said Tuesday he had pressed Colombia President Alvaro Uribe to improve his government's record on human rights but praised his efforts to stabilize the country and reduce the flow of drugs into the United States. "I've been a supporter of human rights for my entire life and career," McCain said after a nearly two-hour meeting with Uribe at the president's seaside mansion here. "We have discussed this issue with President Uribe and will continue to urge progress in that direction. I believe progress is being made and that more progress needs to be made." It was the first meeting for the GOP presidential hopeful on a three-day visit to Colombia and Mexico. McCain is a strong supporter of a proposed free trade agreement between the U.S. and Colombia and he planned to promote it and other hemispheric trade deals during the visit. His Democratic opponent, Barack Obama, opposes the Colombian agreement, which has stalled in the House amid concerns about continuing intimidation and violence against labor leaders in the country. Thirty-one trade unionists have been murdered in Colombia so far this year, eight fewer than last year, according to the Medellin-based Escuela Nacional Sindical, a labor research institute. Speaking to reporters, Uribe said he and McCain had discussed Obama and what Uribe described as "positive" comments by the Illinois senator about Colombia. It was unclear what Uribe was referring to. Pressed to elaborate, McCain said he and Uribe hadn't discussed the presidential campaign but agreed on the importance of bipartisanship in dealing with international matters. "The only discussion I had concerning the presidential campaign is that I believe any partisanship ends at the water's edge. I won't speak of the presidential campaign," McCain said. McCain praised Plan Colombia, a program the U.S. government launched 10 years ago to reduce cocaine production in the country. Because of Plan Colombia and other efforts, the price of an ounce of cocaine on U.S. streets had risen substantially, McCain said. "Drugs is a big, big problem in America. The continued flow of drugs from Columbia through Mexico into the United States is still one of our major challenges for all Americans," McCain told ABC's "Good Morning America" Wednesday in an interview from Cartagena. The Arizona senator flew south after a campaign swing through Indiana and Pennsylvania, accompanied by his wife, Cindy, and two colleagues and top supporters of his presidential effort, Sens. Lindsey Graham, R-S.C., and Joe Lieberman, an independent from Connecticut. On Wednesday, he planned meetings with other government officials and business leaders, and a tour of a Naval base before departing for Mexico City in the evening. Speaking to reporters on his campaign plane en route to Colombia, McCain said fighting illegal drugs would be as much a focus of the visit to Latin America as promoting free trade agreements, which are widely unpopular in several general election battleground states that could determine the outcome between him and Obama. "We want to talk about drugs to a large degree. We'll talk about drugs, talk about free trade, talk about relations with our countries, talk about a lot of the issues we have," McCain said. McCain is a strong supporter of NAFTA, the North American Free Trade Agreement, which has been blamed for draining manufacturing jobs away from industrial states like Ohio and Michigan. Obama has vowed to renegotiate NAFTA if elected to include enforceable labor and environmental provisions. Earlier Tuesday, Obama's campaign organized a call with labor leaders to criticize McCain's trip. "He's hopping on a plane and going to Colombia and Mexico to talk about how much our trade agreements are going to help those countries, rather than talking about what we can do to help this country," said United Auto Workers Vice President Terry Thurman. McCain has acknowledged his support for NAFTA is a hard sell in industrial states reeling from the loss of jobs. But he insisted the voters there know the U.S. economy is changing and that retraining for the new economy will be beneficial to the country and to their families over time. "I'm confident that the American people - a majority of them understand we are in a period of transition," McCain said. "And meaningful re-education and training programs will give our workers another opportunity to be part of the information revolution we're in today." NAFTA and other free trade deals were a flash point in Obama's primary campaign against Hillary Rodham Clinton. 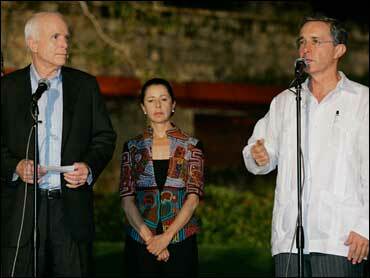 McCain's trip to Latin America followed a visit last month to Ottawa, Canada, where he also promoted free trade. In Mexico City, McCain also planned to address illegal immigration - an emotional issue both for Hispanic voters and many conservatives. McCain co-sponsored Senate legislation that would have allowed illegal immigrants to stay in the U.S., work and apply to become legal residents after learning English, paying fines and back taxes, and clearing a background check. The measure failed last year and McCain since has talked primarily about the importance of boosting border security, and less about a pathway to citizenship for those in the country illegally. He batted away questions about whether the trip was designed to curry favor with Hispanic voters, an increasingly influential voting bloc in some states. "I try to reach out to all voters," he said. "I try to reach out to mothers whose children have succumbed to addiction to this terrible drug. I am reaching out to all Americans who believe our relationships in this hemisphere are important."